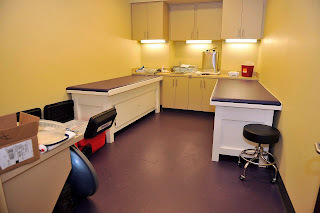 The Volleyball Athletic Training Room is located in the southwest corridor of the PMAC and houses the Women's Volleyball team. This facility is equipped with 2 treatment tables, therapeutic modalities, and a rehabilitation equipment. The Volleyball Athletic Training Room is used for daily treatments and rehabilitations.